Some people have this attitude when, after a day or two, they feel they have not made any progress. Another case was a person who was required to take the English equivalency exam in order to apply for a U.S. You cannot practice this way. Once we see how we are hooked and how we are swept along by the momentum, there’s no way to be arrogant. The trick is to keep seeing. On the contrary, they are unable to practice. The master looked out of his hut and saw a man about to cross the river. Can a Buddhist monk have a family? A true totality would not even be considered “one”; it can only be called “nothing.” It is only when a distinction is made that the one can subsist at all, and in that cases it will lead to two. They often make the mistake of exerting physical energy to fight against wandering thoughts. True nature is Buddha nature, unfixed and able to adapt to any container, so we will all express Buddha nature differently. Every person is a unique container and what is appropriate in one bowl may not be appropriate in another bowl. Our lives, too, are made up of different containers. Your body-mind is one container, and your family is another. Your work and living situations are containers, and our Earth is a container. For each situation a different manifestation is appropriate. Practice is all about learning how to recognize and manifest our true nature in everything we do. To become confident, free and joyful in manifesting our true nature takes a lot of attention and practice. Zazen is the way we accomplish this. 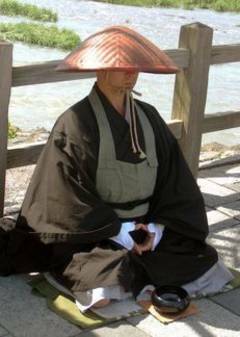 Through zazen, we learn how to be who we really are.